The Mugali take their name from the village in which they live, called "Mugu." Mugu is located in the western portion of the Himalayan mountains of Nepal. In appearance, the Mugali strongly resemble the Tibetans. They are tall and healthy, with a fair complexion and straight black hair. They speak their own language which is similar to Tibetan. Most of the Mugali men also speak Nepali, the official language of the country. 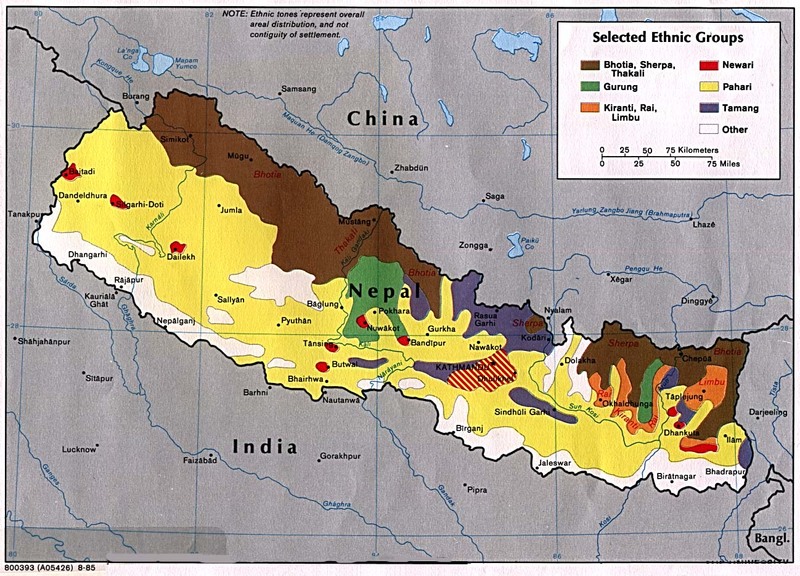 While most of the Nepali are farmers, the land is undeveloped and the country as a whole is poor. However, the Mugali are one of the wealthier ethnic Tibetan groups in Nepal. Katmandu, Nepal's capital city, attracts visitors because of its many picturesque temples. Such temples are characteristic of Buddhist art and architecture. More and more, hikers and mountain climbers are using Katmandu as a major base for expeditions to Mount Everest. The Mugali earn their living in different ways depending on where they live. Because farmable land is in short supply in the mountain areas, the Mugali living there do little agricultural work. Most make their living by trading, weaving, or raishing livestock. In the main bazaars there are a number of wealthy Mugali. The Mugali homes are quite unique. Because they settle in mountainous areas, they build their three-storied houses out of wood and stone. The flat roofs are made of wood, then covered with a mud mixture. Each story consists of a single room with no windows. There is a door on each floor and there are small holes in the walls for ventilation. The ground floor, called the goth, is where the livestock are kept. The next level, or chhipra, contains their store of grain and salt. The upper floor, or koga, is used as a living room and kitchen. A notched ladder provides access between floors. Mugali families are large. In the past, parents arranged marriages for their children at age 5 or 6. The ceremony would take place when the children grew to be 15 or 16 years old. Young people would have no choice about whom they would marry. Today, however, this practice seems to be in a transition stage. Lhosar is the main festival of the Mugali, and it is celebrated twice a year. At the end of December, they celebrate the aunsi, or "dark moon." A second lhosar festival is held again at the end of February. These festivals are times of singing and dancing. While dancing, the married males wear white turbans, and the married females wear a particular type of golden ornament. Although Nepal is the only official Hindu state in the world, the Mugali are Buddhists. Buddhists believe that life consists of suffering caused by the desire for existence. They also believe that in following "The Eightfold Path," they can alleviate suffering and achieve enlightenment. Most of the Mugali village priests are also farmers, unlike the typical monks who serve in other Buddhist sects. They worship a god named Chamdendae, which is a four-legged creature holding a flower and a prayer rosary. The Mugali are one of the most isolated people groups in the world, both geographically and spiritually. The Mugali have had no chance to hear the wonderful news that Jesus Christ came to set them free. Who is willing to take the Gospel to them? * Pray for those Christians who have spent time in jail in Nepal for the Gospel, and have suffered for the name of Jesus. * Ask the Lord to open the hearts of Nepal's leaders to the Truth so that they will change the laws that restrict the preaching of the Gospel. * Ask the Lord to call people who are willing to go to Nepal and share Christ with the Mugali. * Ask the Holy Spirit to soften the hearts of the Mugali towards Christians so that they will be receptive to the Gospel. * Ask the Lord to raise up a strong local church among the Mugali.View Mugal in all countries. Location in Country: Originally from Mugu Village. Most now live in Gamgadhi, Mugu’s neighboring district Jumla, and in Kathmandu.